If you are one of those competitive junkies with a hunger for outdoing your foe then Stardunk is a perfect game for you. Developed by Godzilab, it comes with a heady mix of action, great graphics, concentration, and rivals from all corners of the globe. In the game, you are situated in the Milky-Way and your prime objective is to dunk the basketball in the net. No players, no basketball courts. Just a basketball, a net and your fingers to slay the competition. The points are given on the basis of how clean the shot through the hoop is made; there are four rectangles that lit up with every basket. When all the four rectangles light up, a bonus action kicks-in. This bonus action is determined by the particular ball and its attributes in the game-play. As the game progresses, players have the opportunity to unlock more than 20 unique balls, each with its own capabilities and attributes. 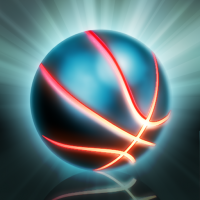 Furthermore, players can also go ahead and create their own custom basketballs with amazing new visuals. Graphics will be the talking point of the game and it is true eye-candy with the numeral different backgrounds available for in-gameplay. Stardunk connects the player with thousands of online players and compares scores in real-time. Game-play is really simple and largely dependent on your angle calculation skills for basketing the ball perfectly. The game bears a very close resemblance to iBasket for iOS, but nevertheless holds its own ground. Competitiveness of Stardunk does not stop on Android, the game is also available on the iOS platform. The iOS platform has both, a free version and a paid version for $1.99, which eliminates in-game advertisements. A big drawback for me was to sign up for Plus+ to play online with the absence of Facebook connectivity. Though its a minor issue and it can be lived with. The entire game objective might be repetitive, but it is the global competition scene that will surely keep users hooked for endless arcade gaming fun. So players, its time to go to war.